The building is three stories high on the front and four on the back. One beam runs the full length of the mill and is 10" x 10" and is hewn of one solid log. It was hand planed. One beam on the second story is not quite as big, but also runs the length of the mill. There are six timbers, 15" x 15" underneath the mill which run the full width. The braces and most of the posts are put together with wood pegs. The building measures 35 ft. x 60 ft. It is of wood construction and built on rock pilings. A small service door leads to the small 10 ft. x 10 ft. side room on the left and the inside office is constructed of 10" horizontal boards, tongue and groove. The window openings are 3 1/2 ft. x 4 1/2 ft. and are on the west side and north side. A service window in the office is 2 3/4 ft. x 3 ft. and is 5 feet off the floor. The work area door is situated on the east beside a plank door. The wheel well upstairs is on the west end. A door leads to the west end for grain dropping. There is no staircase now leading up to this compartment. The mill consists of three stories. The wheel works from the east side from the second floor. The ground level side which contains the main service entrance is for loading. The pitch of the roof contains a circle decoration which works as ventilation. The gabled roof has brackets along the under cornice ledge. The east side has five upper story windows. The spokes of the wheel are in. 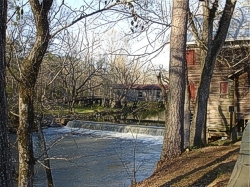 The mill was built by Confederate Army Captain Forney. Forney died before completion, and his wife allowed the contractor to complete the mill. The contractor was a German from South Carolina by the name of G. E. Morris. He was an inventor and had a foundry in South Carolina where he made all of the gears and parts used in the mill. He had hired a man to build a water wheel for him and the man slipped in and patented it two hours before Morris got to Washington. Morris went home and changed the design on his wheel and it worked better than the first one. He made money, while the man who stole his invention went broke. Morris also had a single mill down below the mill (the foundation still stands). Split shingles, about three feet long, were put on the mill originally. Morris was building three other mills at the same time. Union soldiers burned them, but missed the Kymulga mill. 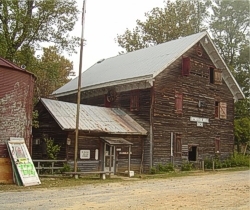 Mrs. Forney eventually sold the mill to James Baker who owned it for many years. He sold it to a dentist, Dr. Hurd, and he sold it to John L. Carter in 1949 who operated it as an active mill until it was sold in October 1973 to Ed Donahoo. The lumber and timbers were cut from the mountains across the creek and the big timbers were hewn out in the surrounding woods. All lumber was cut using water power. None of the windows have bars. The side jutting out over the water is 29 ft. long. The structure contains a tin roof and has iron brackets and hinges. The lower windows have flat iron bars across the opening for strength. The mill has five sets of grinding rocks, with two sets coming from France. A slave drove two yoke of oxen to Mobile to haul them back to the mill. They are called French Buhrs. They are thought to be the hardest rock in the world. One old set of rocks in the mill was used in an old mill which was across the creek before this one was built. The mill was run by three underwater turbines. The water powered turbines ran the mill, lights, and grain elevator. The elevator holds 3,200 bushels of shelled corn.